Recently, I was lucky enough to be invited on a trip to the West Coast. On arriving at a small settlement we noticed a couple of keas, one on the chimney of a nearby house and its mate in a nearby beech tree. The two of them, both juvenile birds, one to two years old, were busy, and there was quite a kerfuffle. Some of us grabbed cameras and took photos while admiring the two birds, their clown-like behaviour and their vocal performance. We were excited seeing them so close. A short while later our excitement was interrupted by a person shouting from a car window in an angry voice: “they’ll be dead before long, they’re destroying my glasshouse!” We stood there somewhat dumbfounded, as kea are not only a protected species under the Wildlife Act 1953, they are the only alpine parrot in the world, and they are endemic to the South Island. Kea are one of the most intelligent birds, but sadly the species is at risk and the population has been decimated to between 1,000 and 5,000 birds. Consequently there are now serious concerns about its long term future. 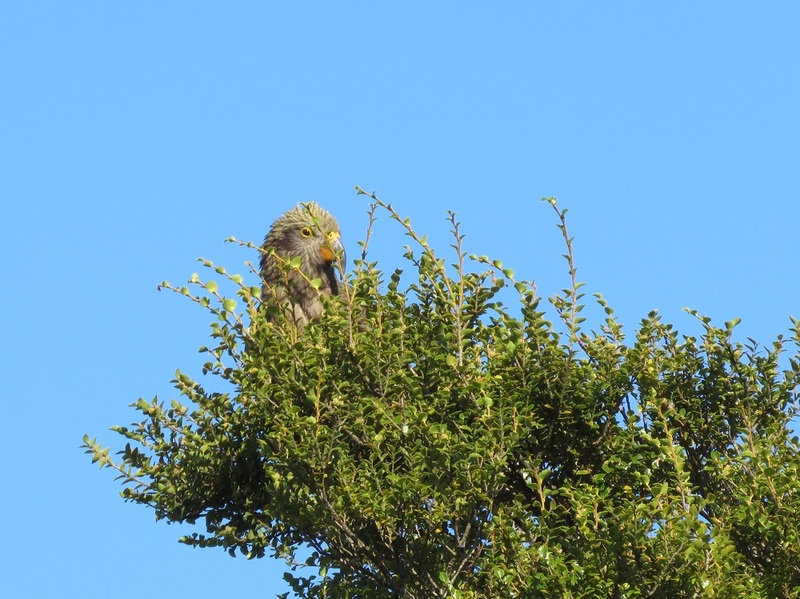 As a matter of survival kea are inquisitive and nomadic social birds, while these characteristics may help them find and utilise new food sources, according to this recent episode on the Coast, it might be their demise as well. It is disappointing to think that people do not appreciate these curious birds in the neighbourhood. Surely it would not be that difficult to think of ideas on how to deter kea from damaging a glasshouse? We are aware of the challenges closer to home as we have visits from pukekos from time to time. These birds are also inquisitive and certainly have a tendency to ‘destroy’ all sorts of crops within the vegetable plots. A couple of years ago they bashed down the corn cobs and stripped them, so we put some netting up to stop the pukeko getting all of the crop. They also managed to get at the feijoas long before they were ready to harvest. Covering the plants with nets has saved the fruit from being poked full of holes, this means that damage control from the other accomplices, the silver eyes, is also kept at bay. The pukekos have also done a good job of digging up the potatoes, unfortunately spuds full of holes aren’t useful! It certainly is a continuous challenge to outwit the birds, and although not rare, the pukekos are a colourful addition to the suite of birds we enjoy every day. 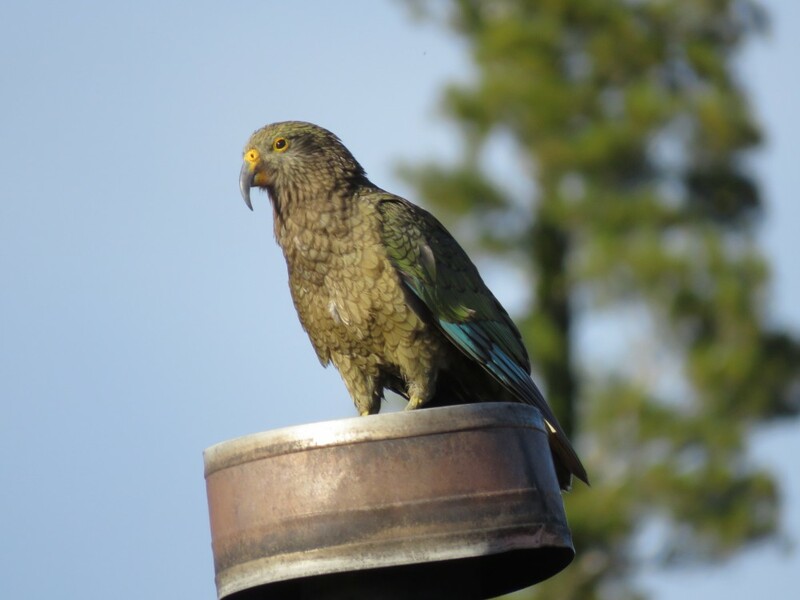 In some parts of Wellington, near the Karori Sanctuary, residents enjoy kaka flying over or visiting gardens. When I visit friends in the inner city’s Aro Valley I always look out for the kaka, and each visit our friends have always new stories to tell. However it seems some people are upset by kaka stealing fruit from gardens or nicking the odd piece off the clothes line, not to mention screeching during the night. Back home after I returned from the Coast, a resident of the Geraldine Downs came up to me and reported having seen a falcon circling over the house that day, which was indeed exciting to hear. We are lucky enough to see them from time to time, but once it would have been common to see them on a regular basis, just as one would have heard morepork most nights. Ines Stäger is a landscape architect based in Geraldine, a former board member of the Royal Forest & Bird Protection Society and a committee member of the local branch. 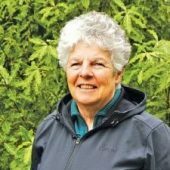 Ines Stäger is a landscape architect based in Geraldine, a board member of the Royal Forest & Bird Protection Society and a committee member of the local branch. Thanks Ines, I enjoyed your words and pictures. I was reflecting on yesterdays news story about a Danish tourist convicted for shooting Whio. Does anyone know if DOC’s relationship with helicopter operators extends to requiring the operators to check they are carrying licensed and knowledgeable hunters? I can’t help but feel the “brain dead” individual should not have been flown onto conservation land without having his permit inspected, and that an operator who did not do this should also be penalised. Thank you Nigel, I don’t know the answer to your question. It would seem common sense to check for a licence and permit. To identify the target before pulling the trigger is also common sense . The hunters that were to control pukekos on behalf of DOC, but shot takahe instead didn’t identify the targets.